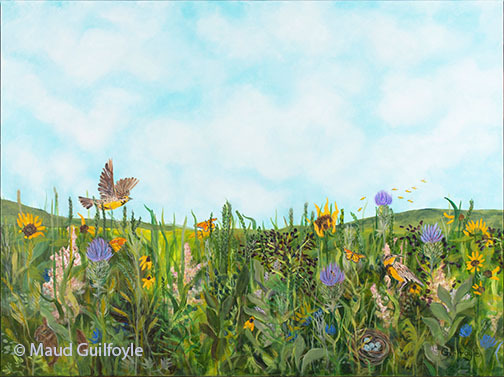 In 2013, an article in the New York Times about the disappearing meadows and Monarch butterflies made a deep impression. Maud has several friends who are beekeepers, gardeners and farmers, who help keep her aware of accelerating social and environmental challenges resulting from human activity in our world. While on daily walks in her neighborhood, she was wondering what new painting project to pursue. Over time, she noticed how a neighbor’s front and side yard became overgrown with a riot of green plants. 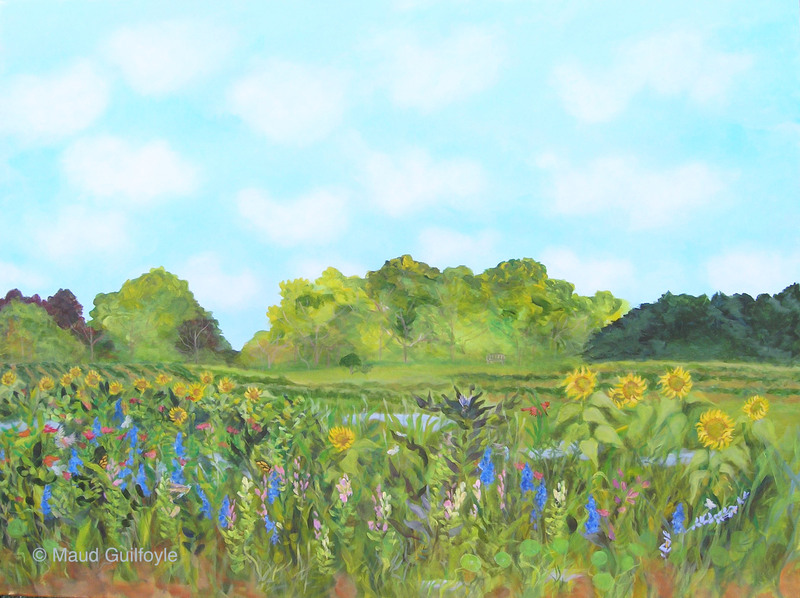 After a few weeks, wildflowers began to appear, which in turn attracted butterflies, songbirds and honeybees. 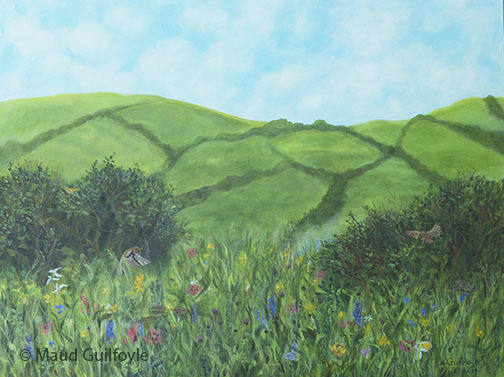 Maud painted this, her first meadow painting, in September, 2013. On April 4, 2014, artist Maud Guilfoyle attended a talk at Cooper Union, NYC, entitled “Nature as Measure: What’s the Future of Farming?” presented by The Land Institute and the Berry Center. 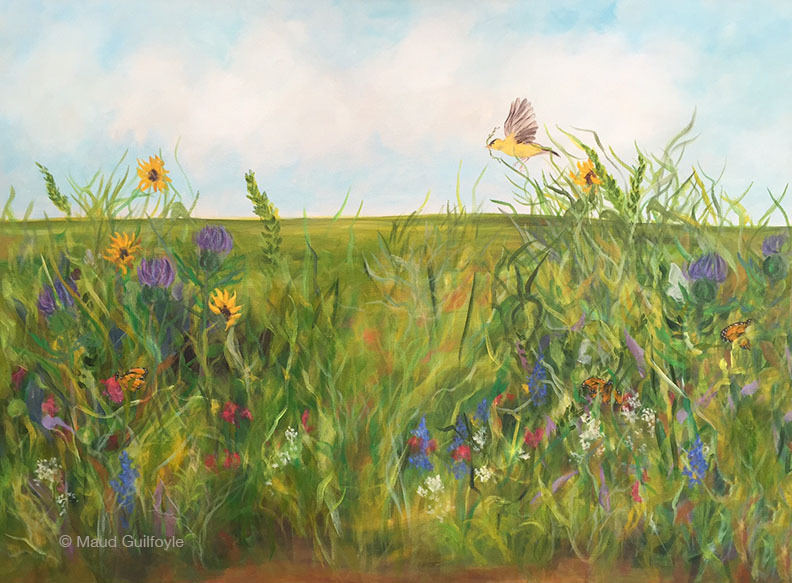 She was so inspired by the work of Wes Jackson at The Land Institute and the poetic common sense of Wendell Berry, that she painted what a Kansas meadow could look like with a fully developed perennial polyculture. Her recent series of root paintings reflect work by the Land Institute and other organizations worldwide protecting and regenerating topsoil with deep roots. Winter Roots is now in it’s new home. 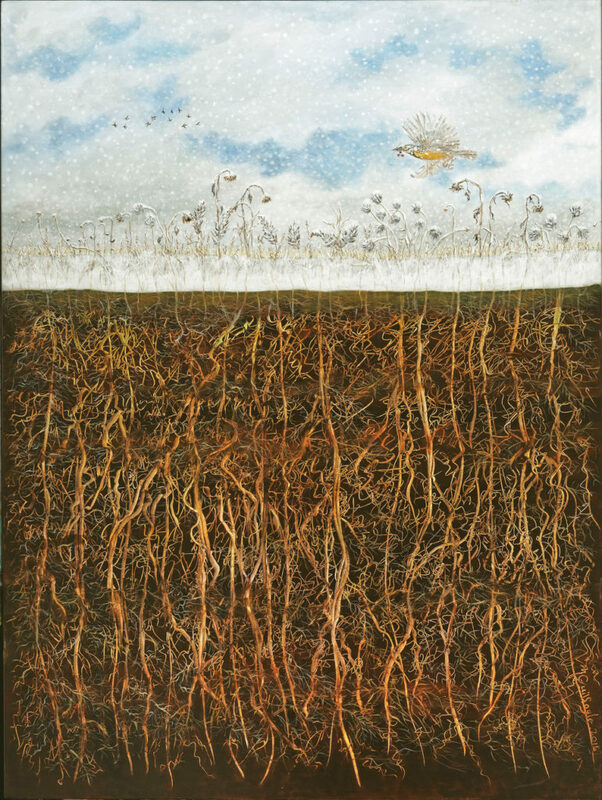 Winter Roots was inspired by the work of the Land Institute the land institute the land institute https://landinstitute.org in Kansas where the developing of perennial polyculture food crops is preserving and creating topsoil. These crops have 20 foot long roots instead of roots a few feet long at most. I wrote blessings for the earth in the roots. On April 4, 2014, artist Maud Guilfoyle attended a talk at Cooper Union, NYC, entitled Nature as Measure: What’s the Future of Farming? presented by The Land Institute and the Berry Center. 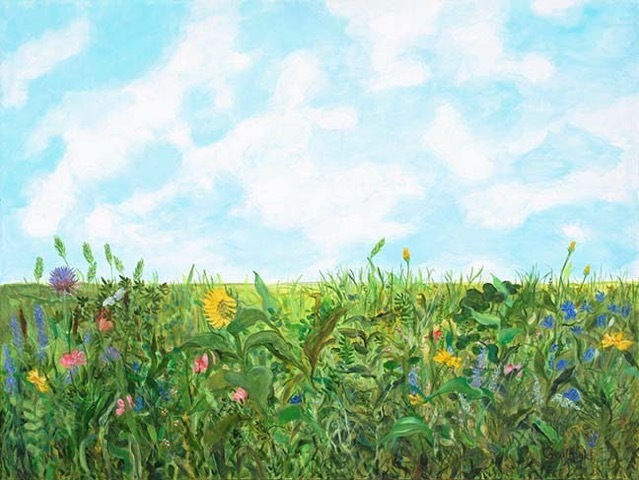 She was so inspired by the work of Wes Jackson being done at the Land Institute and the poetic common sense of Wendell Berry that she painted what a Kansas meadow could look like with a fully developed perennial polyculture. 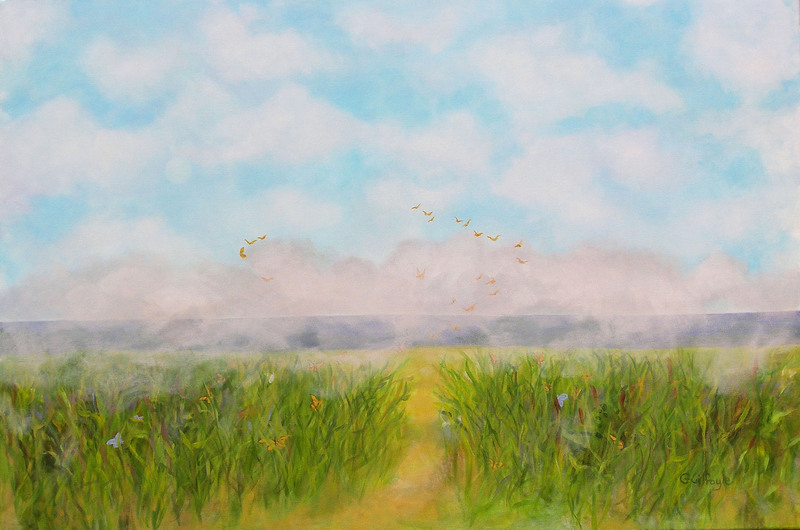 In 2013 an article in the New York Times about the disappearing meadows and Monarch butterflies made a deep impression. Maud has several friends who are beekeepers, gardeners and farmers, who help keep her aware of accelerating social and environmental challenges resulting from human activity in our world. While on daily walks in her neighborhood, she was wondering what new painting project to pursue. Over time, she noticed how a neighbor’s front and side yard became overgrown with various plants. After a few weeks, wildflowers began to appear, which in turn attracted butterflies, songbirds and honeybees. 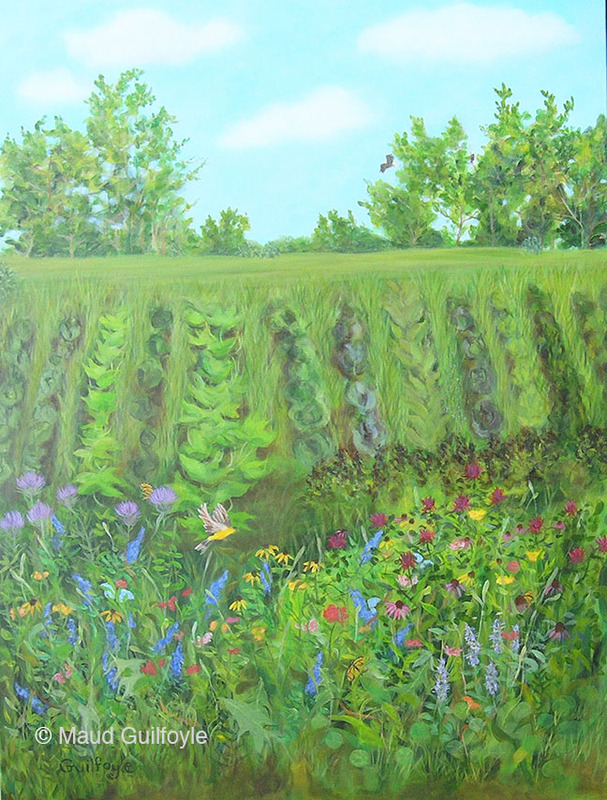 Maud painted this,her first meadow painting, in September, 2013. She has been encouraged by very positive responses to her paintings of meadows and woods and is now aligning her art with organizations working to preserve and recreate healthy, diverse environments worldwide. Those who view these paintings of meadows and farms are delighted. One person said “It makes me feel so happy”. 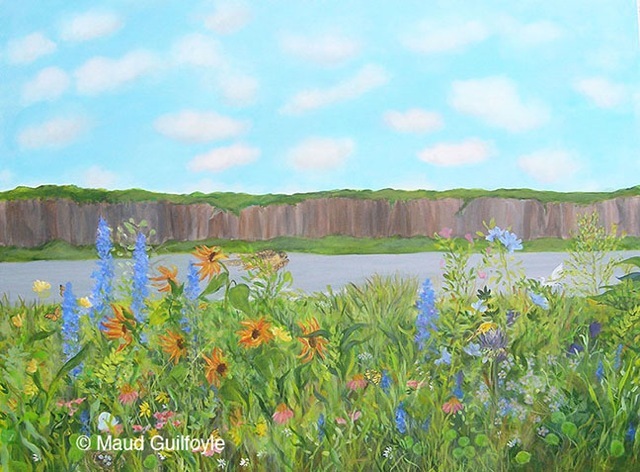 Another comment was “I remember my grandparents’ farm … I can hear the insects, birdsong and smell the grasses and flowers.” Meadow VI has a view of the Palisade cliffs over the Hudson River from Wave Hill Gardens, New York. 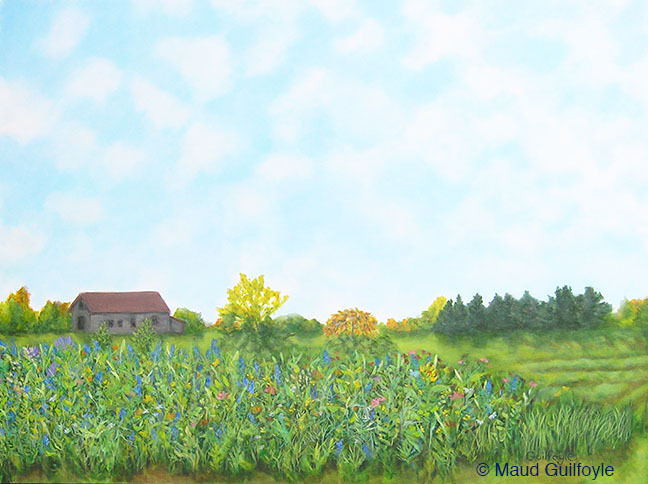 In 2015 Maud painted Meadow IV and Meadow V of Old Hook Farm. During a very icy, cold winter she painted in the greenhouse at this farm and during the day when the sun was shining she was warm and the light was perfect to paint by. Sometimes eagles visit here and can be seen in the background.